On a recent visit to the San Diego Zoo my son did the unthinkable - well, at least to a parent. He ran out into the street just as one of those big tour buses was coming up the hill. Why would he do such a thing? He knows better. I knew the bus would slow down, or even stop because they don't go that fast anyway, so I proceeded to run after him. I know, not smart. Before I could grab his arm, he was kneeling down on the ground. What on earth ... and then I saw it. Of course. The only reason my son would run out in front of a moving vehicle was to save some sort of creature. How he saw it is still a question I can't answer, but right there in the middle of the pavement was a beautiful caterpillar. One who was sure to meet his fate against the tires of the bus if Dylan hadn't run after him. Lucky for us (and the caterpillar) some other people were still in the street by the Polar Bears and the bus had to slow down. Dylan gently picked up the caterpillar and we walked back to the sidewalk. Now that we were all out of harms way it was time to introduce ourselves to this little creature. 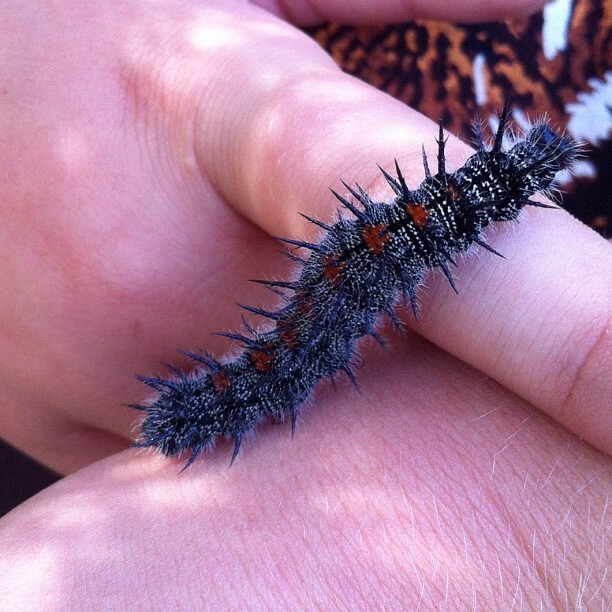 This was the softest caterpillar I have ever touched and at the moment when Dylan let me hold him, I realized the reason he ran out in the street. Once you hold nature in your hands, you are forever connected and the desire to preserve and protect becomes second nature.